Love Island couples have been dropping like flies in the past couple of weeks. Now another couple have decided to split up. 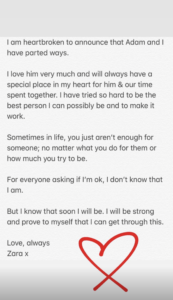 Adam Collard and Zara McDermott have broken up. Zara took to Instagram stories to announce the news today. I am heartbroken to announce that Adam and I have parted ways. I love him very much and will always have a special place in my heart for him & our time spent together. I ave tried so hard to be the best person I can possibly be and to make it work. Sometimes in life, you just aen't enough for someone; no atter what you do for them or how much you try to be. For everyone asking if I am ok, I don't know what I am. But I now soon I will be. I will be strong and prove to myself that I can get through this. This breakup news comes just weeks after Megan & Wes announced their break up following jealously rumours with Wes' Dancing On Ice co-star. Meanwhile Jack Fincham & Dani Dyer are still going strong despite reports of their split.